Ideally located,Completely renovated,Very peaceful,Near to Grenoble, All mod cons. Lovely apartment. Plenty of space for 4. Sunny balcony. Half term so it was busy everywhere buy we had a great stay. The apartment offers everything you need for skiing holidays. It is well maintained and clean. There is enough space for 4 people (we were 2 adults and 2 kids) and 6 can sleep there but it might be a bit tight. The kitchen is well equipped with all the necessary utensils as well as a dishwasher and a washing machine. 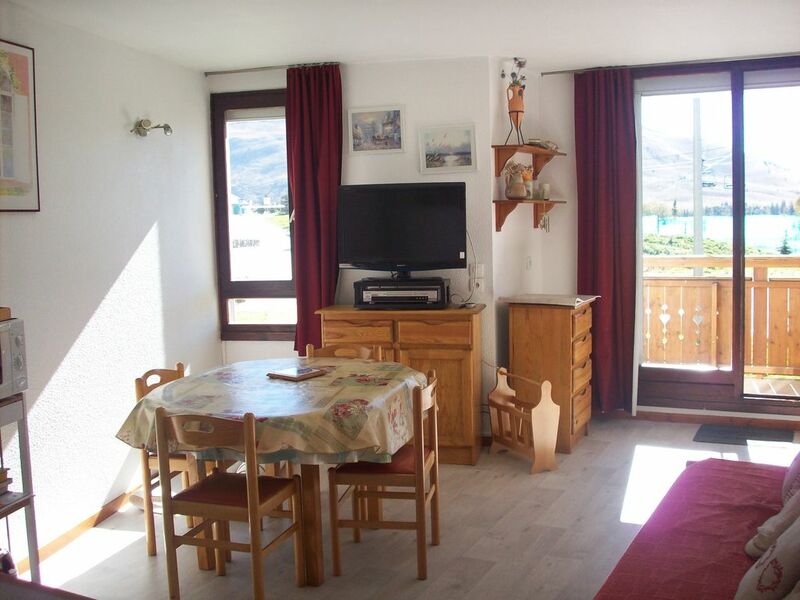 The apartment is perfectly located, 5 min walk from the slopes, ski schools, skipass office, supermarket and restaurants. As the apartment is on the ground floor there is some limited traffic outside and occasional skier passing by the balcony - it was not an issue for us but it might be for some people. The owner - Mme Loeullier is a helpful person and she did show us around and explained the basics. She was also very flexible regarding our arrival and departure. There is no WI-FI in the apartment. Overall, if we were to come back to Alpe d'Huez we would be happy to stay in the same place again. I think your car hasn t be well parked because on residence parkings it s ok 24h on 24h. Good sized apartment that's perfectly suited to a family of four. Bigger than many of the apartments you find in French ski resorts and never felt cramped. Well-equipped kitchen with a huge fridge freezer. The covered parking is very close by and the lifts are about 200m-300m walk. The commercial centre is a two minute walk away but being in Les Bergers it's a bit further to the swimming pool and other attractions in the centre of the resort. Snow allowing you can ski right back to the apartment. Hope to stay again. My family of 4 stayed here for our annual ski trip. The apartment is perfect for four, but OK for more if you don't mind sleeping in the lounge. Tiny little cabine bedroom for the boys but they were quite happy and there was lots of storage so no problem and much better than having them in the hall or lounge. The apartment faces the back of the building and it was lovely and quiet. The ski locker was secure. The flat and the ski locker are both on the ground floor so no hassle. The piste that goes past the Club Med carries on to the back of the building so you can ski back. The supermarket is a short walk away and the kitchen has all you need for making food on holiday with a little oven, microwave and hob. As a bonus there is a massive fridge freezer, bigger than my one at home so you can have frozen chips and ice cream! We used Bens Bus from Grenoble and the bus stop is very close by. The car park was just there too. I would recommend this apartment. "Nice apartment, small but well equipped and clean. One double bedroom plus one little room with bunk beds (no window). Good shower and bath. The owner is helpful. Excellent location - 2 mins walk from the lifts. / Appartement petit mais beau, bien equipé et propre, bonne douche et bain, et avec une propriétaire sympa. Remontées a 2 mins. Je recommende." "Excellent variant for rest with children! Apartment is pure, convenient, with all necessary set of house technics. A fine site is in 100 meters from the basic lifts, shops and ski school. Public parking is just 20 m away." (Text automatically translated) To Grenoble, follow the direction of the stations Oisans towards Bourg d'Oisans and Alpe d'Huez, then exit area is. Restaurant La pomme de pin, le petit creux, la taverne Lowenbrau.